From time to time, participants in the college’s study abroad to Nishinomiya, Japan, led by Tom Salsbury, will be giving updates on their experiences. This one was written by graduate student Jerimiah Sataraka, and has received no editing from the college. Dr. Martin Luther King Jr wrote these words in the Maroon Tiger, an Atlanta, Georgia college campus newspaper back in 1947. And they have never been more relevant and true than today. 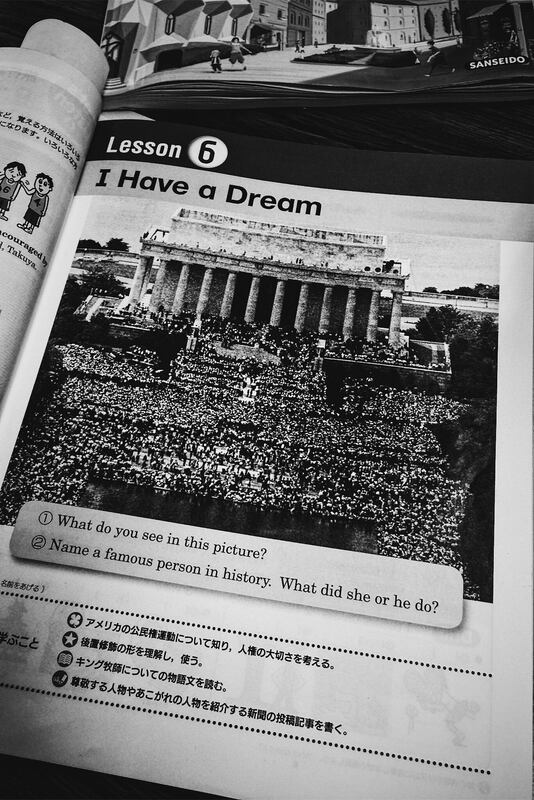 While flipping through the 9th grader’s English language textbooks, I came across an English language lesson they’ll soon have around Dr. King’s “I Have a Dream Speech,” Rosa Parks, and racism during the Civil Rights Movement. Granted they didn’t include the word racism in their textbook, but they had images of segregated water drinking fountains and highlighted some stories of racism. Say what?! I wondered how the students at Izamu Junior High School would react to this part of USA history. This is a textbook that is used across the school district, so 9th graders across the district would be talking about this. What questions would the students have and how would teachers answer them? Hands down my favorite part of this experience has been interacting with the students. From the ones who seem to be disengaged or shy to those who are very excited to see us and want to ask a million questions a minute; every interaction has been memorable. We usually do introductions with a new group of students in class and students seem to have some difficulty saying “Jeremiah,” but after a few tries, they get it. We practiced interviewing each other and helped the students practice their verbal English speaking skills. This got me thinking about their future lesson on Dr. King. How much of their lesson would be focused on the facts regarding the Civil Rights Movement, how much would be focused on enunciating specific English words, and how much would be on developing empathy and understanding racism? This led me down a path to asking a question about racism in Japan. Did it exist? If so, how did it function? And how did it impact schools? These questions were the central focus of my presentation during our seminar today, which happens after we spend time in the Japanese classrooms. From presentations on gender norms in schools, to learning how the Japanese number system works, and to my presentation on racism in Japan and schools (i.e. especially focused on the experiences of multiracial Japanese called “hafu”), we spent some time having critical discussions on what we’ve observed in classrooms and researching other topics related to Japan and schools. Going back to Dr. King’s words, I hope that not only will the Japanese students learn the “hard facts” about the Civil Rights Movement and develop empathy and understanding regarding human rights, but that students in the USA will also be learning about this. Race and racism are prevalent parts of our society. Whether we as educators choose to acknowledge the ugly parts of history and help future students develop empathy and “good moral character” so that history is not repeated will depend largely on our schools and educational systems. Schools are sites of socialization- this is a huge observation I’ve made in Japan during the week and a half we’ve been here. But that doesn’t mean they can’t be sites of liberation. There is hope for the future, and I caught a glimpse of that in a Japanese 9th grade English language textbook. Brandon Chapman joined the College of Education in August, 2013. He helps share the great things accomplished at the College of Education. Perhaps it’s leading research. Perhaps it’s scholarly publications. Maybe it’s a great story about a faculty or staff member, or even a student. Whatever the case, it’s Brandon’s job to get the word out there, to both internal and external sources. Brandon has more than 12 years experience in marketing and communications, including with the Department of Early Learning, various local radio stations and TV stations, The Seattle Post-Intelligencer, and Sports Illustrated. He most recently headed PR and media relations efforts for Longview Fibre Paper and Packaging. He spent two seasons (2006 and 2007) as a professional baseball play-by-play broadcaster. Brandon received his master’s degree in broadcast journalism from Syracuse University’s prestigious S.I. Newhouse School of Public Communications. Before that, he earned his B.A. from WSU’s Edward R. Murrow School of Communication (he double majored in Spanish). He was a sports editor at The Daily Evergreen, and took an active role with both Cable 8 and KUGR. He was a WSU Community College President’s Award recipient. He won the Murrow Award in 2004, as well as winning the first ever Keith Jackson Award for excellence in sports broadcasting for a student. He received his associate’s degree in Radio/TV from Centralia College. Brandon is married to Sarah and they have four boys. Brandon is a Pullman City Councilmember, having won his seat in November 2017.